The Dekaranger SWAT for me has to be the coolest sentai team battlizer ever used. They were first used in episode 33 and in episode 34, they were needed for the Dekawing Robo (my personal favorite mecha in Dekaranger). This is Commander Bunta the one who trained the Dekarangers to use SWAT mode. He is sort of like Commander Ibuki in Changeman. The training may remind one of the classic good old days of Changeman episode one featuring the "hellish" training only this time, they're already rangers. A powerful sensor to use as an x-ray, radar and detector. Well it's been a long time since sentai heroes had these powers. There is the communication which has farther frequency than to that of the regular communicators like SWAT pros. The awesome vests that were not only bullet proof but shock absorbent. Well SWAT vests are always necessary. The leg armor enhanced their kicks double the power in the battiefield. 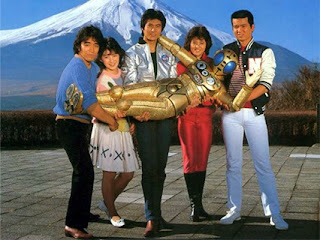 I think Changeman's Star King Bazoo deserves a special spot as well in sentai history. 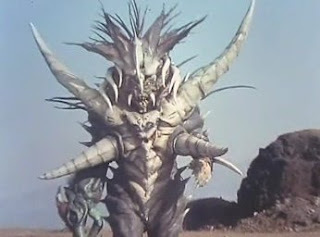 I mean he could be considered by some sentai fans both fan of the classic sentai series of old as the most unique villain due to him being too different. In what way? Well for those not familiar with Changeman, he's actually an entire planet himself with sentience. You can't get harder than that! For some reason, he is a planet, perhaps he wasn't always a planet or something. Well, he could be seen like Ego the Living Planet in Marvel Comics which is apparently only upon fan speculation how he came to be. He was always in charge of destroying sentient species whenever he felt like it and wanted to reshape the Universe. He was also very callous towards his own officers whenever they failed. He had a very harsh policies towards traitors and demands undying loyalty. He was also one to spare some planets that agreed to his rule as well. The evil Highness Rakusha is resurrected by Tsuetsue and Yaba-iba (whatever timeframe this took in is up to you to fit in) which devours the souls of warriors. He made the Orgs more powerful and he devoured the fighting spirit of the other four while they "crucify" Gao Red. In this movie, they meet the now senior Big One with more seniors such as Live Falcon (he really looks old now! ), Mega Pink, Ginga Blue and Go Yellow. 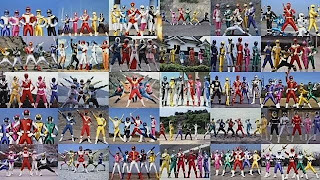 Each one of them had a specific lesson such as Red Falcon teaches Gao Yellow on better swordsmanship, Gao Blue teaches Gao Black on strength, Go Yellow teaches Gao Blue on tactics and Mega Pink teaches Gao White on disguises. The Patstriker is my personal favorite! It's fast and reckless! It forms the main body. 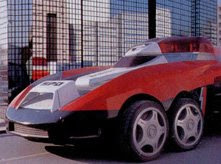 It's really the fastest automobile "zord" ever since Turbo GT from Turboranger. I like the way the Justice Sword comes out and slashes away enemies. The Patgyro is the only one that can fly. It's almost a homage to Red Beet's mecha in B-Fighter. Forms the right leg. This is the fastest mecha ever. It's kind of a deviant mecha as it's the only air mecha while the rest are land (the practice started in Zyuranger). The Pattrailer holds the three signaled cannon for Dekaranger Robo as it forms the left leg. The most interesting enemy of the Boukengers are the Questers. They started as the demon tribe known as the Ashu or a supposed "missing link" in the evolutionary timetable or something. But they were of the supernatural realm nonetheless. Well they were probably sealed off long ago or some escaped anyway. 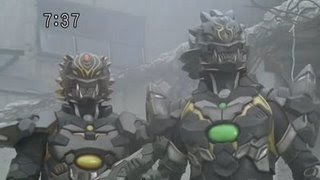 Theoretically speaking, they must have been part of the three demon "gods" or the same tribe of Ragorn from Turboranger. Anyway they were an interesting addition to the series. Perhaps they were the "unexplored" side of Ramu and Gorg on what if they stayed longer for Jetman? Maybe Toei finally decided it was time to do it for Boukenger. Though Maskman is a really old series but Zeba is one of the most unique villains. Why? Well at the start, we wouldn't know he was but a series monster himself hiding behind a guise as the Emperor. So what's the real deal with him? In Maskman, he rules the Tube Kingdom and made it as inhuman as possible, claiming to the throne and all was but who he was. His origins were left hidden until the end but to some fans, he was already obviously NOT HUMAN. Throughout the series, he always aimed to conquer the world and transform it into his own dark image. He was shown merciless and cruel to his subordinates while fearing whatever secret of his may come which made the Maskmen wonder why. He always had his own motives behind every plot like when he allows Kiros to run free or when he decides to kill Baraba. Weapons break and return? Well I do believe that there is always an "emergency spare" prepared for such situations which are used sparingly. I think another super villain romance worth mentioning are Yaba-iba and Tsuetsue of Gaoranger. Well I think there's really something between them since episode one while they roamed the Earth waiting for any Org highness to arrive. The two as an item always went together during missions when they are commanded by the respective highness to fight the Gaorangers. Despite their evil nature, the two showed genuine concern for one another especially during the Loki crisis when they feared for each other's welfare. Tsuetsue showed her genuine concern for Yaba-iba when he went giant worried he would never come back. It greatly sored Yaba-iba when Tsuetsue was killed off by Rasetsu after she was tricked into cutting her own horn which is the source of her powers. Another villain spotlight- I think Tran deserves to be put here too! This was probably Takumi Hirose's most iconic sentai appearance after acting as Liveman's Kemp (this was corrected some time ago, thanks to whoever posted it). Tranza was just Tran the physically youngest Vyram who was just a playful enemy. But the constant bullying and prodding of the other three Vyram members namely Radiguet, Maria and Gure caused him to go enraged and try to defeat the Jetmen as much as possible. While he used his Ant Bazooka monster, he was enraged when he lost again. Using whatever anger he had in him, he accelerated from a child to a fully grown adult to get even with the others. Endowed with power greater than the others, he began to challenge the Jetmen and proved an even greater threat than Radiguet was... that is for awhile. 1980s- the "fashion disaster era"
In the 1980s the super sentai members typically had 80s style clothing and hair. The fluffy hairstyle was very common. The Turborangers however began a trend tht would be copied much- with rather hot anime style outfits. 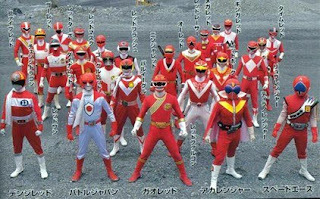 Super sentai looked more civilian. Above are the Jetmen who were probably the most formally dressed super sentai members. Well super sentai series started wearing the uniforms far more seriously and the Anime hairstyle hit again. It started with Timeranger but I like Dekaranger's style the best. 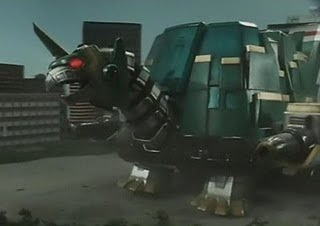 Daimugen is probably the most classic mecha (or zord in PR terms) to ever appear since he's the first one with a human disguise (the second was Futaro who could split up to five of himself). He appeared has a seemingly useless fat jerk who had great hidden power within. He was a goofball character, a comic relief but with an important storyline. The thing is Daimugen unlike Tetraboy has human intelligence like Daimugen. The back story behind him was that he didn't want to fight anymore until he was summoned forward when the Four Deva Kings appeared. With that in mind, he realized if he doesn't fight, the world will perish so he used his diamond to revert to his true self and thus he combined with the other chi beasts to form the Heavy Armor Chi Palace.